There is a lot to see in this urban park located next to the European Parliament. You should know that it is the remnant of an ancient valley, Maelbeek. It used to be more developed in medieval times as evidenced by the remnants of the Eggevoort Tower in park. The park itself was opened in 1880 and it has been said it has very British landscaping elements. Standard park amenities such as running paths benches are there. The pond usually has ducks and geese and swans; the trees are home to mallards, moorhens, and coots; the trees themselves are quite rare breeds. Located on the park grounds are the buildings of the Solvay Conference, the Royal Belgian Institute of Natural Sciences, the Library of Solvay and a museum. Buses 59, 60, 80, N06 stop Jourdan. Buses 21, 27, NAV stop Parc Leopold. Subway 1, 5 stop Schuman. How popular is Leopold Park? People normally club together Museum Of Natural Sciences and Place Flagey while planning their visit to Leopold Park. 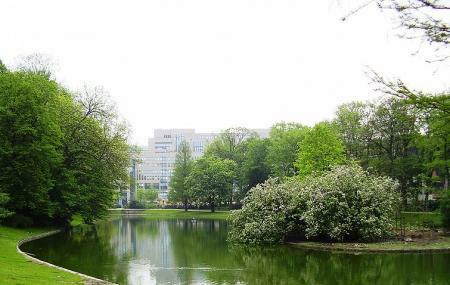 Close to the European Parliament, a park where you can enjoy lunch by admiring swans and other birds. There is no playground for children (under construction). Suitable for jogging. A literal breeze of green in the middle of the European institutions. Although being a small park, the grown trees allow us to feel away from the city life. Lovely park with a small lake close to Place Jourdan and the European Parliament building. Perfect place for a short walk or a small escape from the city noises. They are renovating, you cant get out easily, many of the exits are chained. Lots of confused people. It would be a nice park of you didnt get trapped in it. A lot of people were trying to walk through and had to go back and walk around. The birds are the highlight.